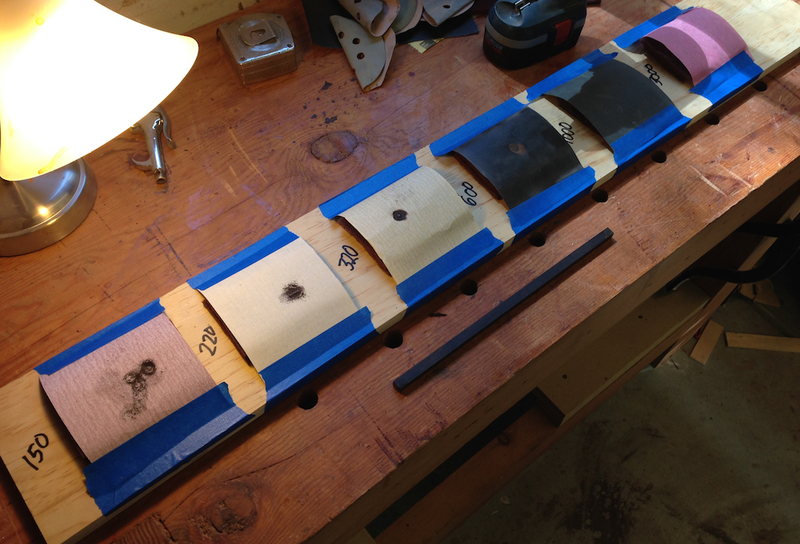 Drum roll…the Ebony pegs are made and glued into the Thorsen table. It feels like I haven’t worked on this project i ages, but it was only last weekend that I finished assembling the breadboard top for the table. Since I had quite a few pegs to make I set up a board with all of my sandpaper grits so I could work my way down the line. This was a lot petter than just having a pile of sandpaper on the bench that I have to shuffle through over and over. Each grit is layer over a scotchbrite pad for cushioning, to help form the pillowed shape on the end of the Ebony bar. 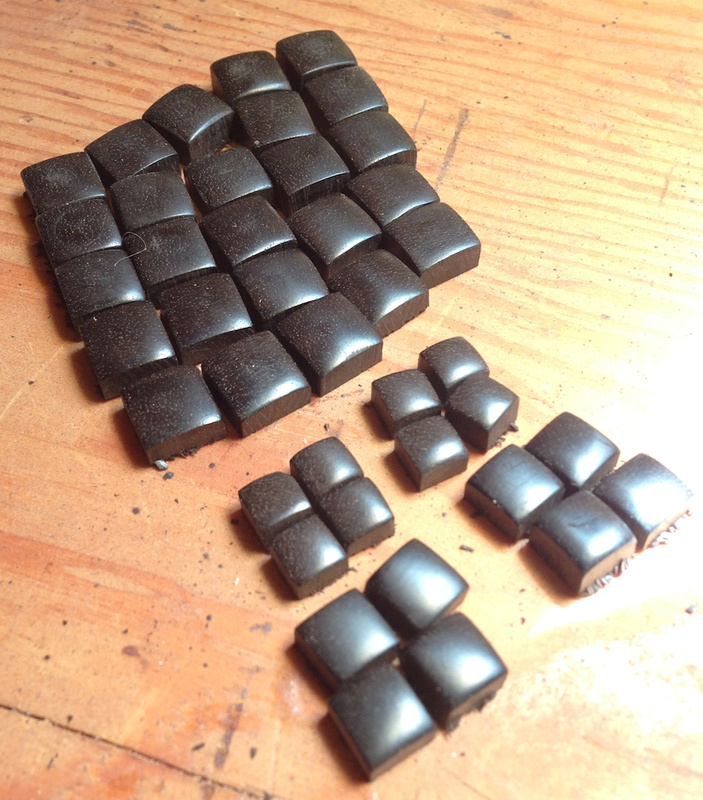 Ebony Peg Workstation. Just out of view to the right is a bench hook with a stop for cutting the pegs off the end of the bar. I’m still on the fence about the “best” way to make the pegs. It seems like it would be faster to spin them against the sandpaper with a drill, although I’m not sure that is the case. I discovered that if I don’t hand sand the end using 150 grit against a flat surface there will still be marks left in the finished end from the saw I use to cut the peg off. Then spinning the Ebony bar with a drill works fine, but it leaves a finish with concentric marks, so I have to do a little hand work on the last two grits anyway. Also, the shape from spinning with the drill isn’t exactly right. I used the drill for about half of the pegs and the the rest buy hand. I think it was about the same amount of time either way. 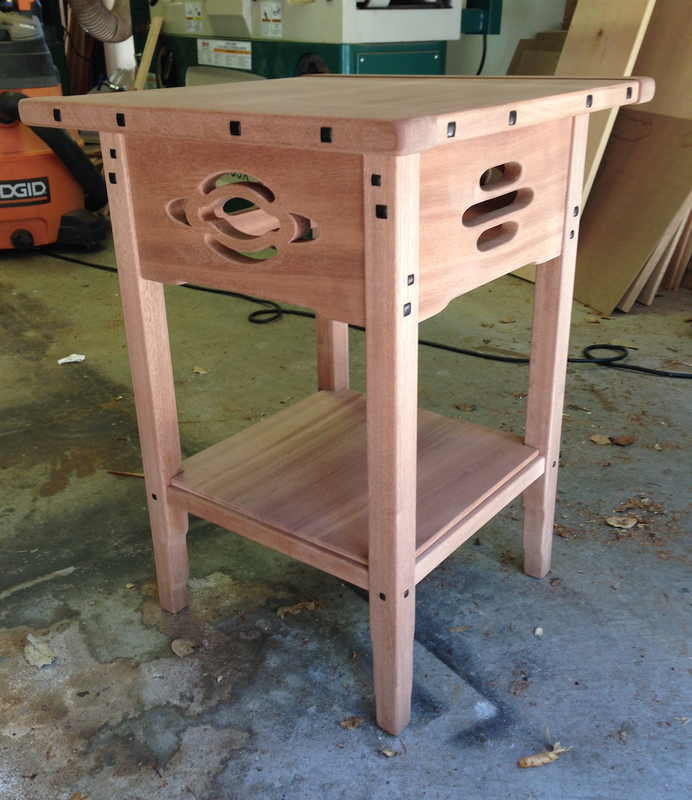 In total, I needed 40 pegs — 24 at 3/8″ square, 8 at 5/16″ square, and 8 at 1/4″ square. You know I was glad to have these behind me. After this picture was taken I used a 1/2″ chisel to bevel the bottom edges of the sides to make it easier to start the peg in it’s hole. I made all of the pens .010″ to .015″ oversized so they are a fairly snug fit in the mortises. Finally I glued them into the mortises. I use a coffee stir stick as a spatula to apply yellow glue in each hole, doing my best to keep it off the surface of the wood so it doesn’t screw up the finish. 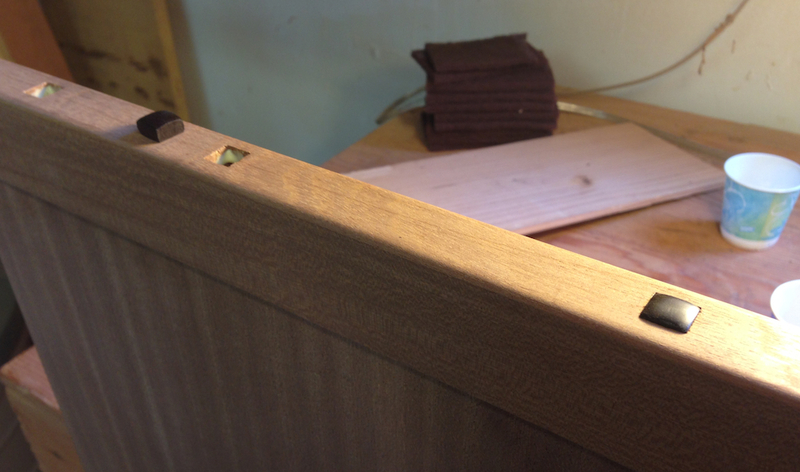 There isn’t anything particularly trick about installing the pegs — although I measures the mortises and made sure my pegs were shorter than the shallowest mortise. Set the peg in the hole and tap it in place with a plastic mallet. Just don’t drive it too far, or put a ding in the surface of the wood. So that’s a wrap for the fabrication on the table. I’m going to finish it without first installing the top or lower shelf. Speaking of which, the garage floor trick work just great to straighten out the cupped lower shelf. After the glue dries for an hour or so I’ll probably apply the dye stain. The pegs are so tight that the glue isn’t even necessary, so I don’t think the moisture from the dye will cause any problems. This is a very nice table. I’ve not done very much research on Greene and Greene, but surly they had a quicker way to make these pins/ buttons. They used so many of them in their designs. I look forward to seeing the table with the finish on it. It will really come alive then. Again, very nice work. Thanks Greg. I don’t know how they did it when the originals were build, but in reality it probably took as long to write the blog post as it did to make 40 peg. Once I got going it only took 45 seconds for each one, maybe a minute tops. In 1908 labor was pretty cheap. That’s probably not far off. I read somewhere that the dining chairs in the Blacker house had about 90 pegs, it might be amusing to count up the number of Ebony pegs in a typical G&G house and it’s furniture. And .. if you wann buy his book .. “you may want to refer to one of my two books for a disc sander jig that will speed the process up even more”. I thought what you came up with was ingenous. Apperenlty its just a tedious task one way or another. I haven’t tried the disc sander trick — I saw it in Darrell’s book. My disc sander is over in the metal shop, and I usually have a fairly coarse (36 or 60) grit disc on it for grinding metal, so that’s not a natural choice for me. I have both of Darrell’s books, they has great step-by-step instructions on making a lot of different G&G details. I gave the table a coat of red-brown dye this afternoon, and a coat of linseed oil. I’ll add shellac and black wax tomorrow and it should be done. Then I need to get cracking on the glass for the cabinet. Ewww!! Wanna see it, wanna see it. You’ll post when you’re done, pllleeaase! Table looks good even with out a finish on it. I like the detail of the breadboards being slightly proud. Overall one of the best looking G&G pieces I’ve seen that I would think of making myself. Thanks Ralph! I’ll post my final plans later so anyone who wants to can build this version.